Last month I criticized the plan to scale back Tysons Corner because of the need for increased freeway capacity. The more I think about it, the more merit I see in the notion that a revamped Tysons Corner will be desperately transit-starved. Freeways, however, are not the panacea. The plan to urbanize the region's most prominent edge city will bring thousands more jobs and residents to the area. Even if the area becomes more self contained, it will require much greater capacity for transportation in and out of the area's densest job center. Tysons will have 4 stations, but they will only be able to handle about 40% of the rides of stations at Silver Spring, Bethesda, Rosslyn, and King Street. Matt Johnson at Track Twenty-Nine created an excellent diagram showing how track sharing by Metro lines closer in to the city prevent the same capacities on the outer spokes of the system (except on the Red Line, which does not share tracks with any other line). Even with four stations, the capacity of the line does not stack up to urbanizations in Montgomery County, Arlington, and Alexandria. Can it support an even larger development with less system capacity? Can the already-clogged North Arlington Orange Line corridor support the additional riders with its finite capacity? Optimal success of the Tysons plan would require more Metro capacity such as a separated Blue Line on a new Potomac crossing. I'm also lead to wonder if this has not contributed to the overall inferior urbanization in Prince George's County. No station in Prince George's has more than 60% capacity because the Green, Blue, and Orange lines all share track inside the District (though the northern section of the Green Line as the potential to do so if the Yellow Line ever runs all the way to Greenbelt regularly). Certainly the County's poor planning policies have contributed to the lack of urban development around virtually all 14 Metro stations, often egregiously, but perhaps lack of capacity has contributed as well. The stretch of Metro in Prince George's County with the most service, the northern Green(/sometimes Yellow) Line has experienced the most development. Prince George's Plaza Station has probably seen the most. 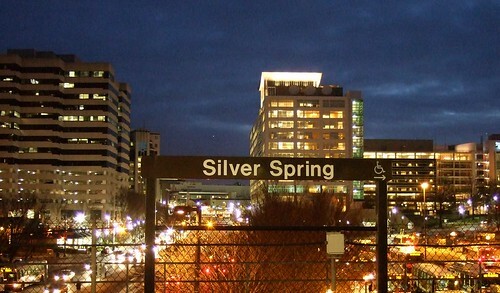 Though not exactly Downtown Silver Spring yet, University Town Center is probably the best example of urban development around a Metro station in Prince George's. Much has been planned for West Hyattsville, College Park, and Greenbelt, though little has come to fruition. New Carrollton, which will have added capacity once the Purple Line comes to town, also has grand plans for development. Stops on the Blue and lower Green Lines, however, are not experiencing as much planning buzz. I have never heard of any study that implies the impact of station capacity versus development around stations, but it stands to reason that the more capacity, the more successful and robust development can be. The Orange Line corridor might be somewhat of an exception. West of Rosslyn, the Orange line can handle about 60% of the trips Silver Spring or Bethesda can handle. The strip is anchored, however, by Rosslyn, which has the same capacity as Silver Spring and Bethesda. David Alpert suggested some innovative ways to create more system capacity by separating the Green and Yellow lines and rerouting some of the Silver Line trains. This would help Prince George's County, Tysons Corner, and other locations in Virginia and still be cheaper (in theory) than a separated Blue Line. If Silver Spring, Bethesda, and Rosslyn are models we seek to emulate, station capacity ought to be equivalent of those successful areas. Dave, your observation about the Orange Line shows that it's not about capacity when it comes to getting TOD off the ground. It's planning. Arlington planned in the early 1970's. Montgomery planned Bethesda in the '80s. Prince George's didn't start anything at PG Plaza until the beginning of this decade. Also, half of the Red Line trains turn back at Silver Spring and Grosvenor during rush hour. The county pays WMATA to send all trains through to Shady Grove before and after rush hour while the eastern side gets no such treatment. Montgomery County is (slowly) going ahead with its redevelopment plans for Wheaton, despite the fact that it gets half of the Metro service as Takoma or Silver Spring. It'll probably be done before anything even goes before the MNCPPC Prince George's for anything on the Blue Line or southern Green Line. Prince George's, as per usual, is just disorganized and behind the times. They seem to want to compete against Fairfax to see who can shoot themselves in the foot more. In regards to the Red Line, you are correct about the short-turns. However, there is no physical capacity constraint keeping those trains which turn back from continuing on to the end-of-line terminals. However, on the Orange Line, the number of trains on any given segment is limited by the number of Blue Line trains sharing the multiplexed segment downtown. That said, I agree with you that it's about planning. PG County is just not on the ball when it comes to getting TOD in the county. Of course, it's important to consider all modes. While New Carrollton essentially has a constraint of 3 trains in any 12 minute peak period (4 min headway max) on the Metro tracks, they also have a station on the Northeast Corridor. Passengers on MARC can be at Union Station in less than 10 minutes and in Baltimore in under an hour. The northern segment of the Green Line also has Baltimore-Washington commuter rail service, although those trains bypass PG Plaza. Note, Matt' is the author of the graphics referenced in post. I think it would be much more efficient to reroute the Silver Line to Anacostia in the interim than to wait until an additional Blue and maybe Yellow Line will be developed and built. This would not only double the capacity of the Silver Line but also bring most of the rest of the Metro system to maximum capacity as well. Make no mistake, the #1 culprit for PG's underused stations is the county. They make me sick. some of the municipalities (Hyattsville, College Park, Greenbelt, Capitol Heights, and New Carrollton) are forcing their hand a bit, the county government is wholly responsible for the blight. I have to wonder, though, how much difference the added capacity would make. I'm a native of inside the Beltway. I am a geographer by trade.